Japan’s biggest toy fair, the International Tokyo Toy Show, is always a good place to discover new gadgets, even if they are originally designed for kids. 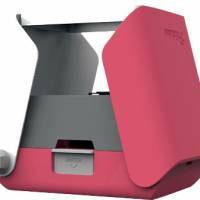 This year it was held June 1-4 and one product proved particularly popular with the adults: Takara Tomy’s Printoss instant-film printer for smartphones. In this digital age of apps, it’s easy to replicate the look of a retro Polaroid on a smartphone. But a digital image or even a printout of one isn’t quite the same as having a physical, glossy photograph. The Printoss is a very simple idea — it literally takes a photo of your digital image and prints it like a Polaroid. All you need to do is unfold the gadget and place its frame at the top. Choose a photo on your phone, and place the phone face-down on the frame. Then push a button on the side of the Printoss. Next, twist the knob (also on the side) until a photo rolls out. Printoss takes a single-focus image of the smartphone’s screen, so there’s no fiddly data transfer. It also uses Fujifilm’s Instax Mini cartridges, which produces smaller-than-usual instant photos, but still with the classic white borders. Best of all, unlike other instant-film printers on the market, which come in the range of ¥15,000 to ¥20,000, the Printoss is cheap — it’s only ¥3,758. That’s a benefit of gadgets made with kids in mind. The Printoss will be available for pre-order in pink, blue or black July 27. On: Tech first mentioned Sony’s Fashion Entertainments (FES) pattern-changing e-paper watch in 2014 (bit.ly/feswtch), when it was a popular Makuake crowdfunding project. Since then, it has found its way into design shops, including the MoMA Design store. It’s no surprise then that Sony has taken the project even further. The original FES looked like a single strip of e-paper encased in plastic — more like a bangle than a watch. The new FES Watch U, however, is a little more sophisticated. It has a stainless-steel-framed glass watch face, silicone strap and a proper buckle. The biggest change, however, is technological. Before, the FES was a standalone product with 24 pre-programmed designs. Now, it works with the FES Closet smartphone app, which allows wearers to pick from numerous patterns (saving up to 24 on the watch), as well use their own photographs as watch designs. The e-paper is still monochrome and changing the pattern of the clock face and strap still takes just one push of a button. Only available in Japan on Sony’s own First Flight’s crowdfunding site, the FES Watch U can run up to two weeks on a 2.5-hour charge and comes in three colors — “premium” black for ¥64,800, and silver and white for ¥49,680. If you’re the kind of person who prefers to cycle to work because it’s healthier, cheaper and more environmentally friendly, Design Labo’s Cube solar-power backpack is probably the ideal bag for you. It’s not the first solar-power backpack on the market, but it is one of few that’s aimed at city business folk, rather than hikers and bicycle messengers. 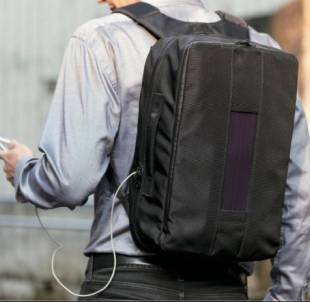 The solar panel is a little more discreet, incorporated into the rectangular design of the bag, which can be used upright as a backpack or on its side like a briefcase. The panel itself is only 1 millimeter thick and is flexible and durable, while the 3300 mAh stick battery is also small and light. The battery needs 36 to 45 hours of sunlight to fully charge and can recharge a smartphone 1.5 times. You can, of course, charge items while carrying the bag, too. As a business bag, it weights just 770 grams, can hold a 15.6-inch laptop and all its accessories, has a maximum capacity of 22 liters and is water-repellant. The Cube is available to order on the Makuake crowdfunding site, to be shipped in November. Let’s hope there’s still plenty of sunshine in the winter.